We are honored that you have selected Alexander-Levitt Funeral & Cremations to care for your loved one’s funeral and cemetery arrangements. For over 80 years, we have served the community with dedication and compassion. We are committed to serving all faiths and nationalities. Our devoted staff strives to honor your loved one’s memory with more than just a funeral or burial arrangement. Rather, a celebration of a life well lived. Our facilities are equipped with Celebration of Life event rooms to create a unique and personalized memorialization of your loved one, including a variety of catering options and musical accompaniments. Our state-of-the-art facilities are designed to meet all your needs – funeral, cemetery, cremation and memorialization. We promise to accommodate any special needs or requests. We understand the process and decisions involved in making funeral and cemetery arrangements while coping with the loss of a family member can be stressful and confusing. Our experienced and professional team is always at hand to assist you and take away some of the stress. We encourage you to visit our location and meet with our staff for any preplanning that you may desire. Our team will guide you through every little detail and ensure that your every need is met in the most professional, caring and personal manner. Jonathan was born in Bronx, New York, and raised in Central Florida. He started his career in funeral service at the age of 18, where he provided compassionate care to families in the Central Florida area, guiding them through one of the most personal times in life before relocating to South Florida in 2011. 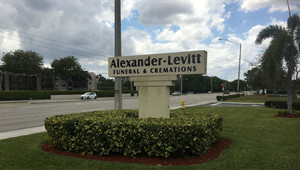 Jonathan started with Alexander-Levitt Funeral & Cremations and Levitt-Weinstein Memorial Chapels in 2011, while pursuing his Associates Degree in Funeral Service from Miami-Dade College. After earning his degree in 2016, he served his internship and worked with Levitt-Weinstein Memorial Chapels before accepting his current role as Location Manager for Alexander-Levitt Funeral & Cremations. When he is not serving families, he enjoys spending free time with his spouse and family.